What is driving the globalization trend? Globalization is a growing trend and as organizations transform into digital businesses with a global presence, their internal systems have to become global systems. These systems must meet global requirements. This white paper looks at what is driving the globalization trend. 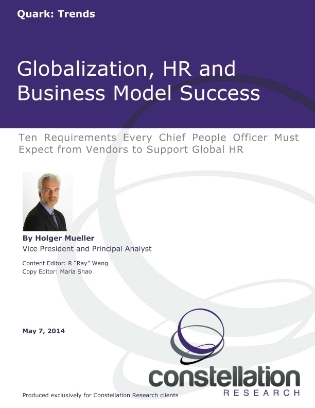 Also listed are ten requirements every Chief People Officer should expect from a global HR system. Get insights into two of Constellation's primary business research themes, Technology Optimization and Innovation and the Future of Work.